Finding the best mutual funds to buy during Donald Trump's presidency will require some research and study of history. However we've done the homework for you and have arrived at the best fund types, along with some specific examples, of mutual funds that could do well while Mr. Trump is in the White House. The best funds for stages of the economic cycle expected during Trump's tenure. With Trump starting his first term with a Republican majority in Congress, he stands a better chance of pushing through his economic policies; therefore the best funds for a Trump presidency may be those that would benefit from almost any Republican president. Defense Sector Mutual Funds: Republicans don't inherently favor war, but they are generally more hawkish than their Democrat counterparts. Although Trump has a nationalist agenda -- one where he would prefer that the U.S. stay out of foreign affairs -- he is still aggressive in posture toward North Korea and has indicated that he is willing to send more troops to the Middle East. Because of this, mutual funds like Fidelity Defense and Aerospace (FSDAX), which focuses on defense industry stocks , could see above-average performance during Trump's term. Financial Sector Mutual Funds: Republicans can be expected to loosen the regulatory reigns on big financial firms, such as those in the banking and insurance industries, as they have in the past. For example, many Republicans have made it known that they oppose the 2010 Dodd-Frank legislation, which has had some negative impact on business investment and banks. A high-quality choice for a financial sector no-load mutual fund is T. Rowe Price Financial Services (PRISX), which invests in big financial stocks like JP Morgan Chase (JPM), Citigroup (C), and Wells Fargo (WFC). Furthermore, the rising interest rate environment means financial companies can charge higher rates on their loans and other financial products. Perhaps the most meaningful improvements that a President Trump can implement for the U.S. economy and capital markets is his tax reform. 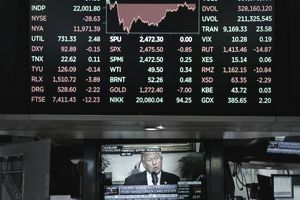 The stock market's general move upward in the months following Trump's election has been attributed to anticipation over his intentions to decrease taxes on corporations, which would in turn increase their revenue. Trump's cabinet assignments also indicate some of his leanings toward specific industrial sectors. U.S. Large-Cap Stock Funds: Large U.S. companies may be the greatest beneficiaries of Trump's proposed corporate tax reform. An actively-managed large-cap growth fund like Fidelity Contrafund (FCNTX) could be a smart choice for a Trump presidency, especially considering the fund's long history of above-average performance and the fund's legendary manager, Will Danoff. A low-cost, passively-managed alternative would be to buy shares of one of the best S&P 500 Index funds like Vanguard 500 Index (VFINX), which invests in approximately 500 of the largest U.S. companies like Amazon (AMZN), Apple (AAPL), and Microsoft (MSFT). Energy Sector Funds: Although energy sector stocks have taken a hit from lower oil prices, energy sector funds are still likely good long-term holdings and can benefit from a Trump presidency. His appointment of former ExxonMobil (XOM) CEO, Rex Tillerson, to Secretary of State, an influential cabinet position, could point to favorable policies for big U.S. energy firms. Investors wanting low-cost exposure to energy stocks like XOM can consider Vanguard Energy (VGENX). Contrary to popular belief, presidents don't control the economy or the stock market. However, as illustrated above, certain political conditions can benefit certain types of investments. The biggest impact on what happens with the economy and capital markets is the stages of the economic cycle that occur during the president's term. There are four stages, or phases, of the economic cycle, including the early-, mid-, and late-cycle phases, followed by the recession phase. Trump's presidency began at what was arguably the mid-cycle phase and will likely include the late-cycle phase and a recession, based upon historic averages. Treasury Inflation-Protected Securities (TIPS): During the mid- and late-cycle phases, inflation is relatively low and expected to rise, which means mutual funds that invest in TIPS can be a smart idea. A good fund to buy for TIPS is Vanguard Inflation-Protected Securities (VIPSX). Floating Rate Bond Funds: These bond funds, also called bank loans, floating-rate notes or “floaters,” can also work well when interest rates are rising because they adjust on a regular basis. The rates are tied to a benchmark, such as the U.S. Treasury bill rate, the Libor or the prime rate. This means that, unlike most bond funds, floating-rate bond funds may actually appreciate in value during periods of rising interest rates. One of the best mutual funds to buy for floating rate bonds is T. Rowe Price Floating Rate (PRFRX). In addition to mutual funds, there are a few ETFs that can benefit from a Trump presidency. One such fund is Wisdom Tree Global ex-Mexico Equity (XMX), which invests in developed and emerging markets throughout the world, excluding Mexico. Another new ETF that stands to gain from a Trump presidency is Point Bridge GOP ETF. This ticker symbol (MAGA) is intentionally identical to Trump's "Make America Great Again" slogan, often referred to as MAGA for short. Whether you use mutual funds or ETFs for investing, it is important to understand that there are no investing strategies or market timing techniques that are fail proof. For this reason, most investors will do well to hold a diversified portfolio. As is the case with many presidential cycles, the second half of a Trump term may not be as positive as the first half. Without any new stimulus, the economy is left to stand on its own. Furthermore, the 2018 tax cuts could have been responsible for much of the outsized market gains in 2017. Once this stimulus has run its course, or even worse, if the tax changes do not create as much stimulus as projected or the increased debt is not offset, stock prices could correct downward. Tariff battles and a Democrat-controlled House of Representatives will not help the President's fiscal agenda, either. If you want to prepare for a volatile and potentially negative second half of Trump's term, check out this article on best defensive sectors to buy, which include healthcare, consumer staples, and utilities stocks. Bond funds could also see gains in a recessionary environment.